Jacqualine (seated) flanked by runners-up Sonia Ranieng on her left and Edlisa Cheri with other finalists. SERIAN: Several organisers of Bidayuh traditional beauty pageants have been chided for naming their events ‘Kumang’ – originally an Iban word – instead of more appropriate terms from their own dialects. Minister of Education, Science and Technology Research Dato’ Sri Michael Manyin believed that the proper name should br ‘Dayung Timungun’ or ‘Dayung Sangon’ – both translated as ‘beautiful maiden’. “We (the Bidayuhs) are not supposed to use the name ‘kumang’ in our traditional beauty contests because that word comes from the Saribas (the way the Serian Bidayuhs call the Ibans). The same goes for ‘kaleng’ (from the Iban’s ‘keling’, which means ‘warrior). “The Bidayuhs should use the term ‘Dayung Timungun (in Serian Bidayuh dialect) or ‘Dayung Sangon’ (Bau Bidayuh dialect). We should use another Bidayuh word to replace ‘kaleng’ as well. Therefore, tonight’s event should be called ‘Dayung Timungun Bidayuh’,” said Manyin prior to officiating at the start of the grand finale of the Kumang Gawai Bidayuh-Sarawak 2017 at Kampung Panchor Dayak village hall here on Gawai Dayak Eve. It is learned that the closest term for ‘kaleng’ in Bidayuh would be ‘Dari Pimagap’, which is in Serian dialect. Manyin’s remarks that evening were taken note of by the organisers and the emcees addressed the event as ‘Dayung Timungun Gawai Bidayuh-Sarawak 2017’ throughout the evening. Nevertheless Manyin, who is Dayak Bidayuh National Association (DBNA) chief advisor noted that the Bidayuhs are currently in a difficult situation as there is still no official and mutually-accepted Bidayuh language to date. “Too many terms are not communally acknowledged by all Bidayuhs – the same goes for the Malay language, unlike Mandarin for the Chinese. That is why we need to keep on preserving our language by retaining original words. We must not replace them with words borrowed from other languages. be embarrassed to serve traditional Bidayuh ‘kuih’. But if they keep on being ashamed, very soon the Bidayuh culture would be gone,” said Manyin, who represented Chief Minister Datuk Amar Abang Johari Openg at the event. Twenty-four contestants took part in the pageant which attracted 100 aspirants in the audition. 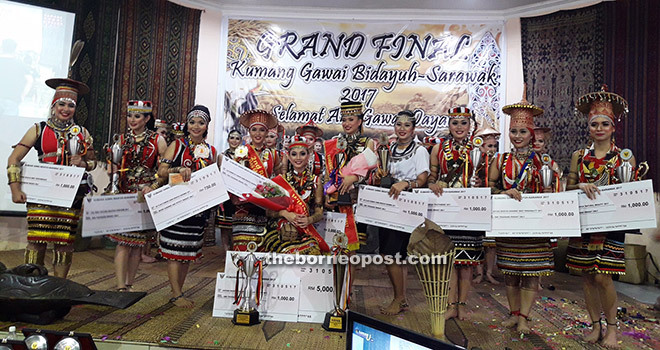 Jacqualine Ayong, 23, a business economics undergraduate from Universiti Teknologi Mara (UiTM) and a native of Kampung Simpok in Padawan was crowned ‘Dayung Timungun Gawai Bidayuh-Sarawak 2017’. Sonia Ranieng Vincent of Kampung Tibiyan Patung was first runner-up, followed by Edlisa Cheri Ping Gabriel Jo’og of Kampung Tian Sekawan in third place. Sonia and Jacqualine also won subsidiary titles of Miss Popular Hotspring (held at Panchor Hotspring on May 21) and Miss Popular (at Vivacity Megamall on May 27) respectively. The ‘Best Performance Award’ went to Saswina A’ong of Kampung Pichin in Serian while Lydia Hyginus from Kampung Simpok took the ‘Best Costume’ prize. Diana Chu of Tebakang Bazaar in Serian bagged the ‘Best Personality Award’ while administrative clerk and freelance model Pamela Achan of Kampung Pangkalan Amo Serian was ‘Miss Natural Beauty’. Elviana Tenit of Kampung Belimbing in Krokong, Bau took the Miss Photogenic subsidiary title.